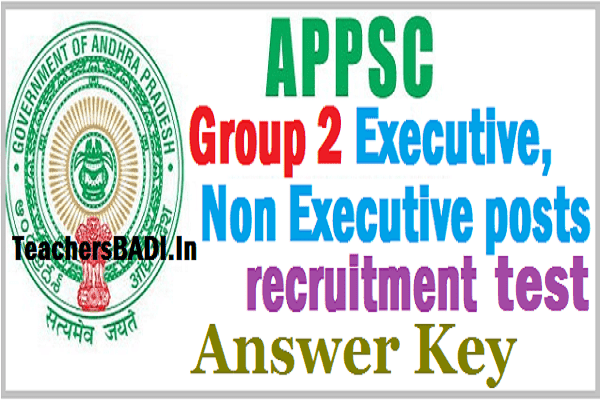 APPSC Group 2 Executive,Non Executives Recruitment Main Exam Results 2017/ APPSC Group 2 Recruitment Hall tickets, Main Exam Date 2017: APPSC Group 2 Answer Key 2017, AP Group 2 Screening Test Key Download, APPSC Group II Exam Answer Key 2017. APPSC Group 2 Answer Key 2017 AP Group 2 Screening Test Key Download from official website psc.ap.gov.in. Applicants who appeared for this exam can get download APPSC Group 2 Answer Key 2017 from below given link or official website. Andhra Pradesh Public Service Commission has recently successfully conducted its the first Group 2 Screening test on 26th February 2017 at specified location centers of Andhra Pradesh. Huge number of job seekers has appeared for this recruitment exam and waiting for AP Group 2 Screening Test Key Paper from long time. After completion of exam organization is going to upload 26th February AP Group 2 Key Solution at official portal. For more details candidates need to visit official website. APPSC Group 2 Main Results 2017 Marks Published @ psc.ap.gov.in, Check it Now: Andhra Pradesh Public Service Commission (APPSC) has published the marks of the candidates who have appeared in the main examination of the APPSC Group 2 Services. The APPSC Group 2 Mains examinations (CBRT) for Group-II Services, 2016 was held on July 15, 2017 and July 16, 2017 at 171 venues across Andhra Pradesh. The Marks of Candidates who appeared in the Mains Examinations of recruitment to the Group II services are made available on the official website of APPSC. The marks of the candidates appeared for the APPSC Group 2 main exam are given in various pdf filed on the website. Follow the steps given in this article to check the marks. According to APPSC, the qualifying marks are as given in APPSC group 2 notification and if any candidate did not appear in all the papers (absent in one or more papers) his/her candidature will not be considered for selection. "In case of candidates whose results are withheld, decision of the Commission will be published soon," a notification about APPSC Group 2 main exam results said. In August, after the Group 2 main examination was over, the commission had withheld the response sheets of 159 examinees, who appeared in the exam, for misconduct. During the examination, due to issues in computer network few candidates were caught, in CCTV camera, disobeying exam hall rules. Then, an official notification, the Commission mentioned that for the 159 candidates 'an enquiry on misconduct of leaving the examination hall violating the instructions' will be conducted under Regulation PME (Regulations For Punishment for Malpractices/ Misbehavior in the examinations). 1. The Qualifying Marks are as given in Notification and if any candidate did not appear in all the Papers (Absent in one or more papers) his/her candidature will not be considered for selection. 2. In case of candidates whose results are withheld, decision of the Commission will be published soon. APPSC Group 2 Key: APPPSC has recently released the notification for recruitment of 892 Group II Services Vacancies. All those interested and eligible candidates were applied through online mode through official website as per schedule. After completion of online application process, PSC AP uploaded the APPSC Group II Admit Card at main web portal. Candidates/Job seeker who are applied for this vacancies candidates were downloaded the AP Group 2 Hall Ticket. Andhra Pradesh Public Service Commission has conducted Group 2 Exam in the month of February 2017. Now appeared candidates are eagerly looking for APPSC Group 2 Services exam Key Paper. Applicants who attended this exam can get download AP Group 2 Screening Test Key Solved from below given links or official web portal. The main examination in On-Line mode for candidates selected in screening test will be held through computer based test on 15/07/2017 FN & AN and 16/07/2017 FN. Job seekers, who were appeared this exam AP Group 2 Service exam can obtain the APPSC Group 2 Service Exam Answer Key 2017. More number of candidates have appeared for this exam and eagerly searching for Group 2 Answer Key AP from long time. Fore more details mentioned below. 6. Analyze your Marks for the exam/ Click on the set that you have been attempted on the day of exam. 7. Take a pdf version of it and download to your pc or lappy to cross check at any time. APPSC Group II Exam: The Group 2 Examination has conducted for 150 Marks with 150 Questions. Paper consists of Multiple Choice Questions with Current Affairs, Economic Development of India and Constitution of India. Check your answers with APPSC Group 2 Preliminary Key. Commission will give key for all sets or series A, B, C and D. Log on to official website psc.ap.gov.in to download the Andhra Pradesh Group II Exam Official Key. Qualified candidates in Prelims exam will call for Mains Exam consists of 450 Marks. Key to the Question Paper of Screening test for Group-II Services held on 26/02/2017 is published today on the website of the Commission. Candidates can examine the key. If there are any objections, they may be sent in the written format available on the website of the Commission. Objections through any other mode like email, SMS, Whatsapp etc., are not allowed. Vague objections and also objections without quoting Question ID as given in key would not be entertained. The objections would be received till 07/03/2017. Late objections would not be entertained. APPSC is not responsible for postal delays. It has also come to notice that certain coaching institutions are making claim that the questions in the examination are from their test series. Candidates are advised not to believe such propaganda. APPSC has no relation with any coaching centre. If any coaching centre resorts to false publicity, appropriate action would be taken. The Andhra Pradesh Public Service Commission (APPSC) on Tuesday published the question paper and answer key of its Group 2 recruitment examination on its official website. Candidates can check the answer key and question paper by clicking on the highlighted words in this line. The commission conducted the preliminary objective type exam on Sunday to fill up vacancies for 982 posts - 442 executive and 540 non-executive. According to reports, 6,67,010 candidates applied for the objective type exam. Candidates can examine the key. If there are any objections, they may be sent in the written format available on the website of the commission. Objections through any other mode like email, SMS, Whatsapp etc., will not be entertained. The main exam for candidates shortlisted in the screening test is expected to be held on May 20 and 21 in online mode. The number of candidates shortlisted for the main exam will be 50 times the number of vacancies notified by the commission. The final selection of the candidates for appointment to the posts shall be based on the merit in the computer based main examination. The minimum qualifying mark in the main exam is 40% for open category (OC), 35% for backward class (BC) and 30% for scheduled castes (SC), scheduled tribes (ST) and physically handicapped (PH) categories. Note: Candidates should visit the commission’s website regularly for updates. PSC group 2 screening test final key 2017 has been released by the Commission on March 16th. In a notice issued at the official website, Andhra Pradesh Public Service Commission (APPSC) has provided the final answers to the questions candidates had raised objections to. The Commission has now sorted out the objections and has found that there was error in framing 3 questions. Citing the reasons as ‘wrongly worded’, ‘no correct answer’ and ‘wrongly framed’, 3 questions have been deleted from the exam. The marks for these 3 questions will normalised for all questions, the commission is to address this matter though. There were valid objections against 2 more questions whose answers were given wrong in the preliminary answer key. The group 2 final key has the correct answers of those two questions too. Below is the list of all five questions which are affected. Apart from objections to these 5 questions, other objections are not tenable. Question no. 2– According to APPSC, this question does not has any correct answer and is therefore, deleted. Question no. 37– The commission said that there was an error in framing the question and this question is also deleted. Question no. 122– In preliminary answer key, the answer to this question was mentioned ‘answer no. 4’. However, in the final key, the correct answer no. is 1. Question no. 141– The final key has noted that correct answer is no. 2 instead of option no. 1 (which was given in preliminary answer key). Question no. 149– This question has been deleted, reason being ‘wrongly worded’. You can find the APPSC group 2 final key PDF here for 2016-2017 exam which was uploaded on Thursday evening on the commission’s website (www.psc.ap.gov.in). Note : Objections would be accepted only in writing,till 07/03/2017. Late Objections would not be entertained. PRESS NOTE: After considering all the aspects, the Commission has decided to postpone the Main examination for Group-II Services, 2016 (Notification No.18/2016) to 15th & 16th July 2017. As a result, the Main examination for recruitment to the post of Panchayat Secretary(Notification No.29/2016) would be postponed to 30th July 2017. Candidates may note the change.